A first part of the index advisor module – the missing index dashboard is now released and available for download. I have been experimenting with different charts to best show the impact of the missing indexes. Any feedback welcome. Big thanks to ColinDouglas92 for contributing to this release. You will notice a new SQL Agent job, scheduled to run once a week, on a Saturday at 6am. SQL Server is kind enough to tell which indexes it *thinks* are missing based on the execution plans. This information is stored in the following Dynamic Management Views. Note. Missing indexes reported by SQL Server are a guideline of what SQL thinks and are not always correct. Care should be taken before applying recommendations. Please make sure you understand your workload and data, do not apply indexes automatically without the full understanding of the implications and impact. There are sometimes valid reasons to not have an index despite the recommendation. avg_total_user_cost – Average cost of the user queries that could be reduced by the index in the group . avg_user_impact – Average percentage benefit that user queries could experience if this missing index group was implemented. The value means that the query cost would on average drop by this percentage if this missing index group was implemented. 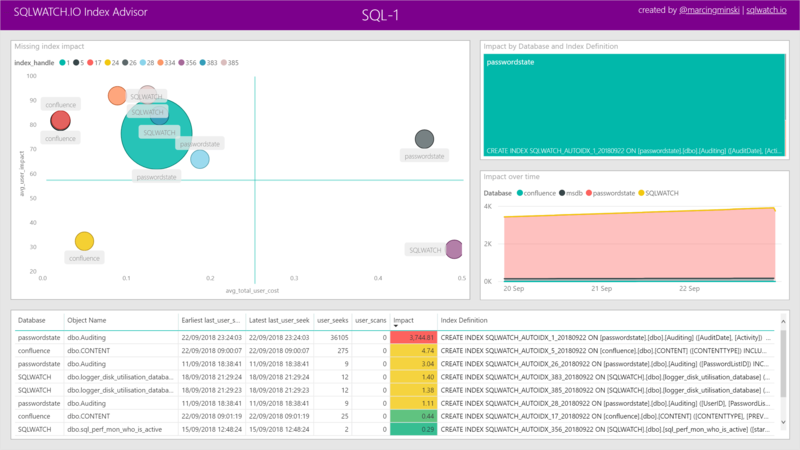 I created a quadrant chart on the SQLWATCH dashboard that takes into account avereage_total_cost (x), average_user_impact (y) and the number of seeks (size). I am hoping this will give you a better idea of the potential benefit and impact. As mentioned above, these recommendations are just a guideline based on cost-estimation and are not always correct. They do not distinguish between clustered and non-clustered indexes and do not take storage impact and write penalties into account. Indexes are logged under a dedicated snapshot_type_id = 3 thanks to which, we can set a different retention period. By default, missing indexes will be removed after 30 days from the SQLWATCH. You will also notice the new dashboard has a slightly different layout, with an apparent purple bar on top. This isn’t me being inconsistent and random but rather me trying to find the best color scheme and design for PowerBI dashboards. Eventually I will re-align all dashboards to follow one standard. Again, any feedback welcome.